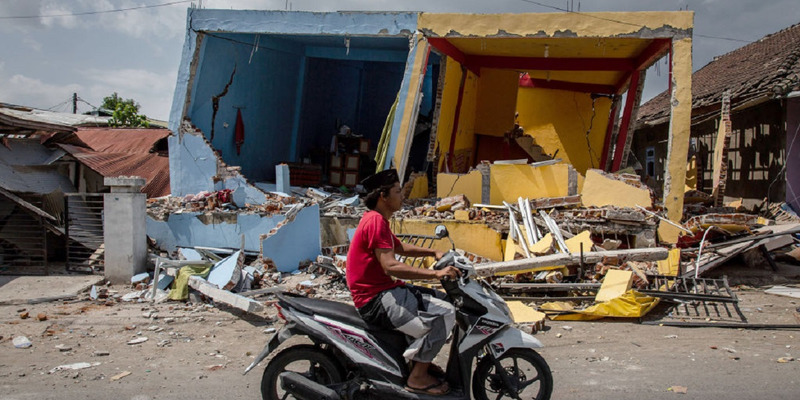 Ulet Ifansasti/Getty ImagesA man rides motorcycle through collapsed houses after Friday prayer following the earthquake in Pemenang on August 10, 2018 in Lombok Island, Indonesia. Another strong 6.3 magnitude quake hit the island Monday morning. At least 14 people on Lombok or nearby Sumbawa island were killed by collapsing buildings or heart attacks, National Disaster Mitigation Agency spokesman Sutopo Purwo Nugroho tweetedMonday. Dozens of people have been injured in the last month. The earthquakes earlier in August have caused an estimated $US469 million in damage.